If you hope to take a dive trip anytime in the next 18 months, this is for you. I've prepared a new 36-page book -- Seven Super Dive Resorts -- and one meh -- and I’ll mail it directly to your US or Canadian address, free of charge! I've pulled together seven complete first-hand reviews from our best travel reviewers who pay their own way and never disclose their purpose. They tell you the truth about the diving, the fish and the reefs; whether the dive boats are comfortable and photo gear-friendly; how good the guides are at pointing out critters; whether the food is gourmet -- or fails miserably; if the showers are hot and the beds are comfortable. We recommend a fine place in Fiji; a new find off Grenada; a bargain in the Philippines where it's not fished out; an insider's favorite in Cozumel; a two-resort budget combination in Indonesia; a sleeper in Honduras... and much much more, plus one famous resort fading into old age. And, Seven Super Dive Resorts is yours free when you sign up for a trial subscription to Undercurrent, which has been serving serious divers for 44 years, longer than any other diving publication. We are a nonprofit organization, our publication never accepts advertising, and every month we give you the unvarnished truth about liveaboards, resorts, equipmentâ€¦the entire dive industry. Each month you receive 20 pages or more of insightful articles and no-holds-barred reviews written by our seasoned and anonymous writers -- they never accept favors -- about diving destinations and liveaboards throughout the Caribbean, Indonesia -- especially Raja Ampat -- Mexico, the Philippines, Hawaii, and Florida, California and Texas, virtually every spot in the world. (And we'll even tell you what resorts and liveaboards to avoid, like the company that has had more than one boat sink). And, unique articles, like why divers die -- we describe the cases so you never have to face the same problems -- why you may have to show a doctor's letter to your next dive resort, or the status of that big lawsuit on dangerous computer malfunctions and software. And, you'll have unlimited access to 20 years of past issues, travel reviews, thousands more reader reports about hundreds of worldwide dive destinations, endless stories on health, bends prevention, safety, travel, recalled dive gear, you name it. Want to find the best place in Cozumel? Florida, Hawaii, the Red Sea or Raja Ampat? A simple search will lead you there. Want to avoid no-see-ums? A search will find you the dive resorts where they are rampant, and there are plenty. My offer? Just $29 for an eight-month trial subscription. Call it what you will -- a cut-rate subscription price with a free book, or maybe a two-for-one offer -- but it's a great offer and for $29, you can't go wrong. Because if for any reason you don't like or need your Undercurrent subscription, I'll return your $29 and you can keep our Seven Super Dive Resorts, with my thanks for giving us a go. Sign up now, and you'll have immediate access to 20 years of back issues and recent reviews on Little Cayman, St. Vincent, Lembeh, the Flower Gardens of Texas, Bonaire and much, much more. And the minute you sign up, I'll mail you our brand new Seven Super Dive Resorts in time for you to plan your next dive trip, if you live in the United States or Canada. And, for the next eight months, Undercurrent will be delivered to your email, as well as being available on the web for you. And, remember. You have my money back guarantee. Just sign up below to subscribe to receive the best and most complete dive information, anywhere. 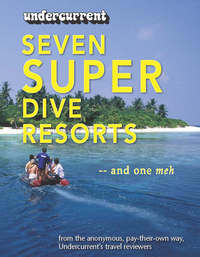 √ Your own copy of the 36 page book "Seven Super Dive Resorts -- and one meh" as a paperback (US, US Trust Territories, and Canada only). √ The all-new online 1,000+ page 2019 Travelin' Divers' Chapbook as well as all past Chapbooks available online for immediate access. √ Make your own Mini-Chapbook, with reader reports on any dive destinations where you select the dive resorts/liveaboards and reports that you want. View it online, download it, print it -- your choice. please indicate your acceptance of the terms of the User Agreement . Yes, I accept the terms of the User Agreement. No, I do not accept.